Scare Off Burglars with FakeTV? What if a gadget that cost the same as one's month alarm monitoring charge could scare off burglars? 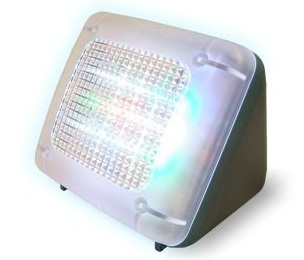 That's the claim of a new product called FakeTV - a device whose entire aim is to cast a glow mimicking a television. While it's brutally simplistic, is it a genius innovation or a mindless gimmick? The device does one job: it is a special lamp designed to cast a glow that looks like it is coming from a television. From the outside of a house, the light makes it appear that someone is inside, dutifully watching late night TV even if the house is otherwise dark and unoccupied. Desk/Shelf Mounted: The small 7"x5"x3" size of the device makes it suitable for placement on bookshelves. AC Powered: FakeTV plugs into a standard 120VAC wall outlet. Day/Night Sensor: The unit 'programming' is limited to turn on when dark, and turning off when day breaks. An included timer can be alternatively used during dusk or dawn hours when light conditions are dynamic. More than a Timer Lamp: The company's website states "Like real television programming, FakeTV is constantly shifting among more and less dynamic periods, more vivid and more monochromatic, and brighter and darker scenes. FakeTV is completely unpredictable, and it never repeats." Inexpensive: Perhaps the greatest benefit of FakeTV is it's cheap cost. A single unit costs $35, which is approximately the same price as a single month's alarm monitoring cost for a traditional intrusion alarm system. Simple: FakeTV requires no configuration or integration for use. A user plugs it into power and does nothing more to make it ready for use. Redundant: A simple rebuttal with equal effect might simply be to leave a TV on during nighttime hours. According to EnergyStar's website, the estimated electricity cost of running a 40" LCD TV for 8-12 hours nightly for a whole year costs about $20. Given that most households already own a television, the cheaper alternative is to simply leave the TV powered up when not at home. Prevention, not Detection: Unlike intrusion alarm systems, FakeTV does nothing to alarm or report an intrusion attempt; it simply intends to discourage it from taking place. While it seems unlikely that burglars would be so brazen to target an occupied house, some reports suggest up to 28% of burglaries happen while the home is occupied. A common security strategy is to 'layer' defenses so that no one system is entirely responsible to keep a facility secure. In the case of FakeTV, it's greatest expected value is when used in conjunction with a 'traditional' intrusion alarm system.